As a growing basketball player, you will notice as you transition to higher levels that players become faster and are able to play for much longer amounts of time. Some players are gifted with the natural ability to grow and develop their athleticism as they age, but for others, rigorous conditioning is required to adjust. There are many ways to increase your speed, and the most elementary way is to simply run. Conditioning for basketball requires game-like situation running, which includes full court sprints, suicides and line-touches, and sliding and back-pedaling. 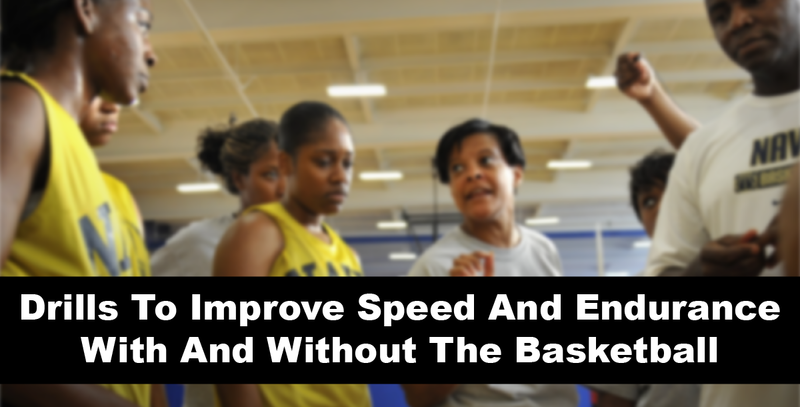 Here are some drills to help you develop your speed and conditioning, both with and without a basketball, to ensure you have the best tools to out-run and out-perform your opponent. The full court layup drill is a great way to practice speed and endurance with the basketball, whether you have a passer with you or you’re dribbling the ball up and down the court grabbing your own rebound. Focus on pushing the ball ahead of you so that you’re running to catch up with the ball instead of dribbling the ball to match your normal running speed. Keep your eyes up-court, going as fast as you possibly can to get up the court with as few dribbles as possible. Maintain control and explode to the basket for your layup, and repeat to build endurance. The thirty-second line touch drill helps maintain speed and endurance without the basketball and develops agility in changing direction. The goal of the drill is to touch each baseline three times (a total of six touches) in thirty seconds or less. What makes this drill unique is the pressure of finishing under the thirty-second time limit while covering the length of the basketball court to simulate the intense running of an actual game. Focus on going as fast as you can for the thirty seconds of the drill, touching each line, and work on consistently finishing in thirty seconds, allowing yourself thirty seconds of rest between each run for proper interval training. Like the thirty-second drill, this drill continually improves speed and physical condition by challenging you to complete 10 line touches in one minute or less. After successfully completing a thirty second drill, the best way to challenge yourself is with the one-minute drill. The focus is the same; keep your speed and change of direction at a high level and make sure to finish the drill at your quickest pace on the court, but it will certainly help you become a quicker, more agile player. Suicides involve running from the baseline to the foul line, retreating to the baseline, running to the half-court line, retreating to baseline, running to the far foul line and retreating again before running a full court sprint down and back on the court. The goal is to finish as fast as possible—if you’re a beginner, shoot for 35 seconds or under—and work on quickness and change of direction. The amount of agility it requires makes it different from thirty and sixty second drills, and will help you become faster on the court. Practicing these drills will make you a better basketball player and will give you and edge on your opponent as you become accustomed to the change of pace at higher levels of basketball. Challenge yourself to beat new times and practice new forms of interval training to not only develop your physical potential but see just how far your mind can take you.